The dual-purpose tank which is known as the digester of the process. A 16-cylinder Caterpillar engine that turns a three-phase, 480-volt generator. Linda Collins | Greene County News Renergy Maintenance Manager Brian Arndts explains some of the operations to two guests touring the main building. 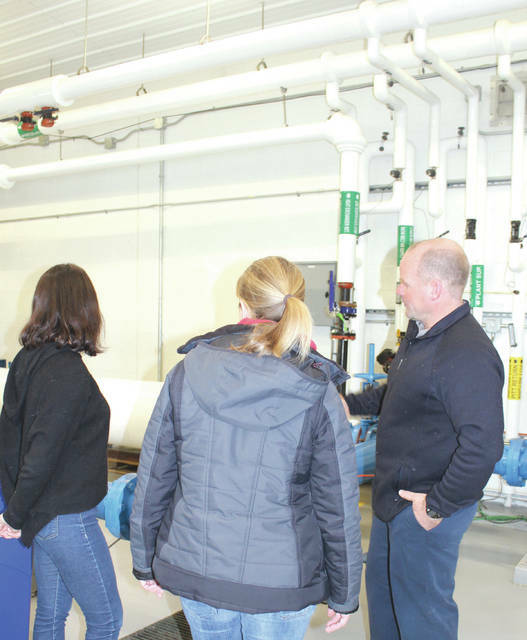 BATH TOWNSHIP — Renergy Inc. held an open house March 17 at its Dovetail Energy LLC Bioenergy Facility in Bath Township and provided tours for several hours so residents could experience first-hand the technology being used there. The open house comes ahead of an Ohio Environmental Protection Agency (EPA) public hearing 6 p.m. Thursday, March 22 at the Greene County Career Center, 2960 W. Enon Road, regarding Dovetail’s permit application to upgrade the biosolids digester facility at Pitstick Pork Farms Inc., 1146 Herr Road. According to Renergy Maintenance Manager Brian Arndts, EPA approval of the permit application would allow Renergy to use a pasteurization process to produce biosolids meeting Class A pathogen requirements. 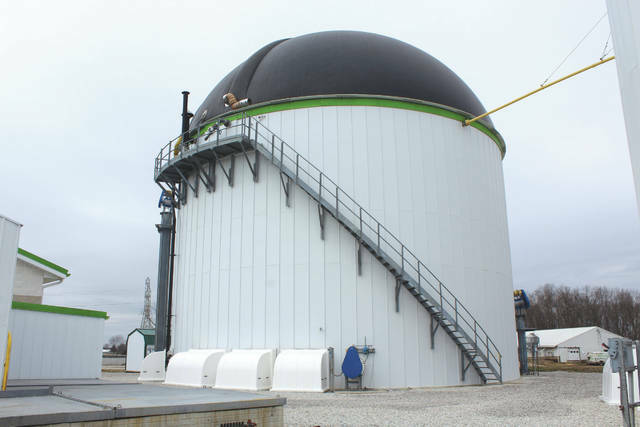 Cari Oberfield, marketing strategist for Renergy Inc., who attended the open house, said the waste processed at the anaerobic digestion facility consists of 70 percent food waste from commercial manufacturing, 20 percent biosolids and 1 percent hog manure. Oberfield said that during the digestion process, all of the toxins and gases, such as methane and carbon dioxide, are extracted and contained. The main building at the facility houses all the electronics and control systems, as well as a heat exchanger and a large pump that circulates material from one location to another. Renergy operators have a full view of all the operations at the site that are displayed across the large screen of the control computer, located in the office. The next step of the process involves a method known as dosing where a consistent amount of materials is fed into the duel-purpose tank (digester) every 30 minutes. A large fraction of the organic material is broken down into carbon dioxide and methane gases that collect at the top of the digester. The settled sludge is processed as an organic fertilizer that is stored in a 5-million gallon lagoon at the facility until it is spread on adjacent farmland. According to Arndts, Renergy contracts a company that applies the fertilizer only under certain conditions to avoid any runoff. Renergy monitors the contracted company as well. Arndts also disputed rumors concerning the facility and the proposed upgrades. Feedback from those residents who attended the open house was mixed. Matt Justice, a geologist who lives in Fairborn, and his sister, Kathy Justice, said they were very impressed with the operations at the anaerobic digester. “I notice that some people are worried about the trace metals contaminating their wells or water supplies. These types of metals are not mobile, and I am not concerned about them threatening the local water supply,” Matt Justice said. Kassie Lester, who lives on Herr Road, said she notice a few things that caught her attention. https://www.fairborndailyherald.com/wp-content/uploads/sites/50/2018/03/web1_IMG_3622.jpgThe dual-purpose tank which is known as the digester of the process. 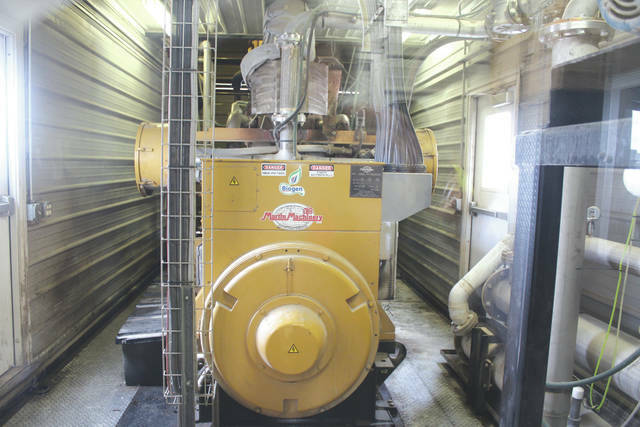 https://www.fairborndailyherald.com/wp-content/uploads/sites/50/2018/03/web1_IMG_3632.jpgA 16-cylinder Caterpillar engine that turns a three-phase, 480-volt generator. https://www.fairborndailyherald.com/wp-content/uploads/sites/50/2018/03/web1_IMG_3614.jpgLinda Collins | Greene County News Renergy Maintenance Manager Brian Arndts explains some of the operations to two guests touring the main building.